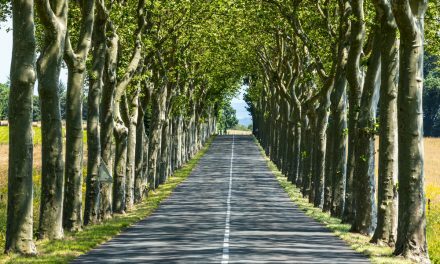 Whether you are looking for a vineyard to start your own wine business in France or a beautiful estate to turn into a luxury boutique hotel or B&B, look no further as we present to you the best options at great prices from our portfolio of French property. Are you looking into creating your own boutique hotel or wine business? 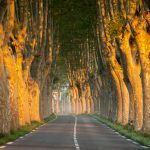 It is truly exciting to entertain that dream in buying a vineyard or an existing B&B property in France and start meeting all those travelers and wine aficionados paying a visit to your place. 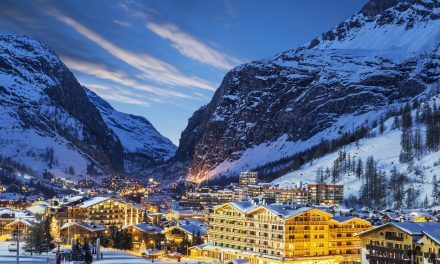 And with prices still at a good level before the French elections in April, it would be an excellent time to invest in a commercial or lifestyle property right now. 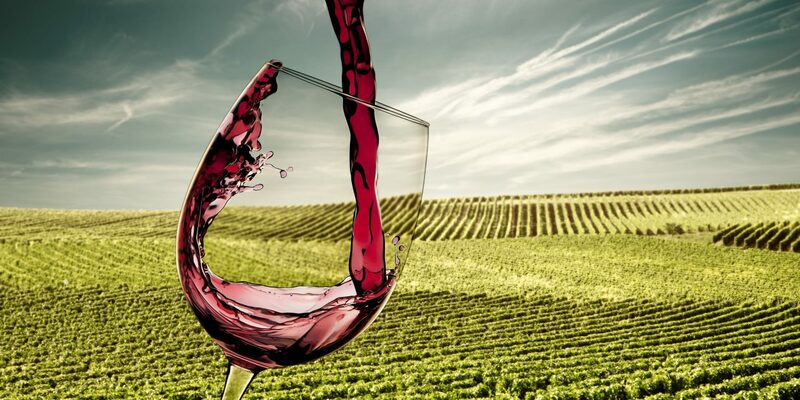 We have entertained a lot of enquiries from buyers all over the world looking to creating their own wine business – people who desire to purchase the best vineyards from prime areas in France that includes Bordeaux, Dordogne, Luberon, Cotes du Rhone, Languedoc and many more. (Contact us to get your free Vineyard Buyer’s Guide). 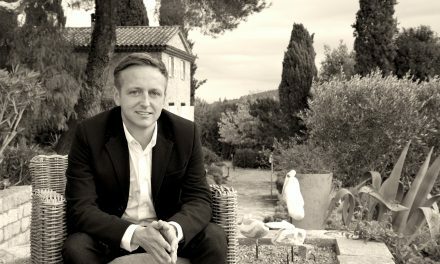 Other property buyers are also looking to purchase existing B&B and hotel properties in the south of France where some of the grand estates and castles are located – a great investment that can prove promising in a couple of years as we see the continuing rise of travelers and tourists coming to France and opting to stay at authentic mansions and homes, experiencing the charming French countryside. Price is another point in purchasing lifestyle and commercial properties and you would be surprised that with less than €700,000, you can already purchase a vineyard estate in the south west of France or an already established B&B or hotel/gite property in yet to be discovered towns and villages. 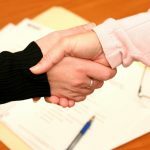 If you are ready to take on that first step in creating your own B&B (check out this article on Bed & Breakfast to guide you) or wine business, here are some existing properties on the market at prices that will make you say yes in buying a commercial and/or lifestyle property right now! See your investment grow as property prices are predicted to increase in the next couple of months. 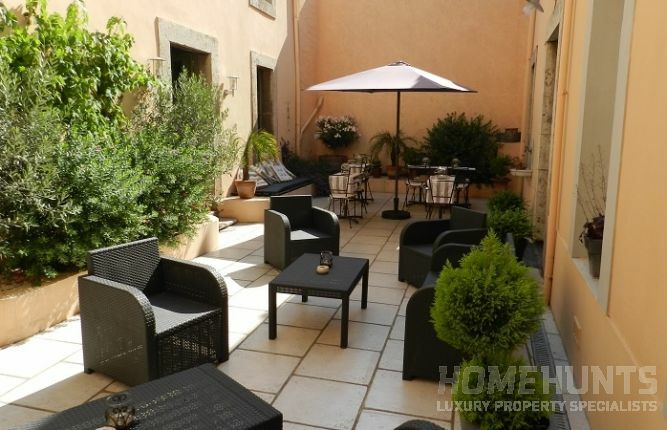 This beautiful property located in Corbieres (HH-7654248) consists of 2 houses, 1 private and 1 B&B, for a total of approximately 468m2, with a sunny courtyard of 65m2 separating the private home from the B&B. It is located in an area that welcomes many tourists throughout the year and is still actually running right now! 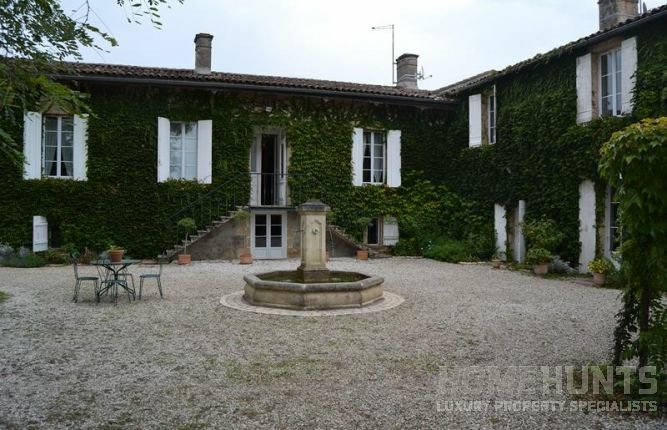 The home, dating back from around 1650, is a classical Maison de Maitre and is located in the town center with all amenities that you may need, like restaurants, grocery stores, schools, banks, doctors, cafes, all within walking distance of the B&B. 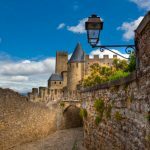 The B&B is located in a town in between Narbonne which is 15 minutes close and Carcassonne in 25 minutes. The B&B has been operating since 2010 and has earned the Tripadvisor “Certificate of Excellence” award in 2012 and 2013. There are 4 large and quiet B&B rooms, all with private en-suite bathrooms. All rooms have air conditioning and heaters, wi-fi, and are individually decorated. There also is a living/breakfast room and a large storage room, great to store bicycles for the intrepid travelers. 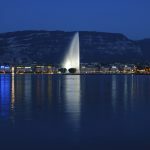 There is an international clientele, and there are standing reservations that could be transferred to the new owners. Revenue figures canbe provided and proven upon request. All furniture in the B&B can be sold with the property as well for an amazing price of €435,000! 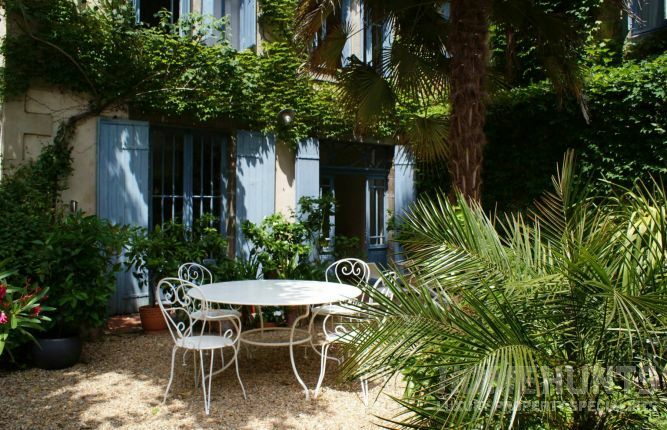 As you enter the premises of this wonderful B&B (HH-11097748) located in Condom, a lovely garden welcomes you. It is truly well situated for passing trade in a thriving village with plenty of amenities. 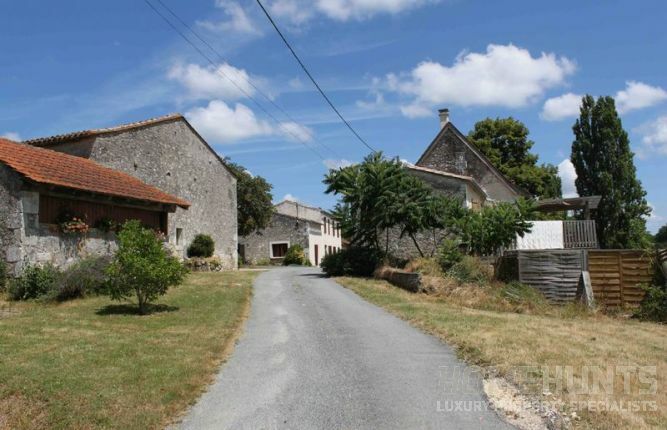 The sale of this property includes a traditional style chambres d’hotes with four grand bedrooms and en-suites and a separate, more modern style, house with three bedrooms and a one bedroom ground floor apartment. Each house can be bought separately. This property is up and running as a successful business and would suit anyone who wanted to come in and start an enterprise straight away. Downstairs is an entrance hall which leads into an attractive reception area with a large dining table and cozy chairs centered around an impressionable stone fireplace, a perfect place to welcome guests even on those chilly winter days. Large French doors that let in plenty of light and air open onto a pretty garden area with seating. From the reception area, you have access to a good-sized lounge also with a fireplace that currently doubles as an office area to book in guests that are staying. Access to the private house is also through the dining area. It is laid out so that it’s possible to run the large comfortable bed and breakfast yet have entirely your own space with kitchen, salon and bedrooms that are closed off from the rest of the property. Upstairs even the hallway is spacious and light. All the bedrooms are very well presented with traditional wooden flooring, high-ceilings, and fireplaces. A garage big enough for one car is attached to the house and there are a couple of rooms dedicated to laundry and storage to assist in the running of the B&B. At a price of € 499 000, this is an excellent deal if you are looking for a business in the Gers. A manageable, award winning, organic vineyard (HH-11147407) in the heart of a respected appellation, this pretty property has a four-bedroom principal house, garden, winery, additional stone barns and exceptional views over the surrounding countryside. Red, white and rose wines are produced from a variety of well managed vines. The property has just under 11 hectares of mostly contiguous parcels of vines, and a well-equipped winery. An additional area of approximately 4 hectares lies within the appellation boundary but is currently fallow. An adjacent detached Perigordine cottage, with gardens, grazing land and stabling is owned by members of the same family. This adjoins the vineyard, and is for sale separately. 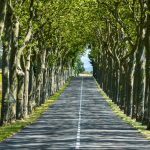 The vineyard is approximately one hour from Bordeaux and 30 minutes from Bergerac. 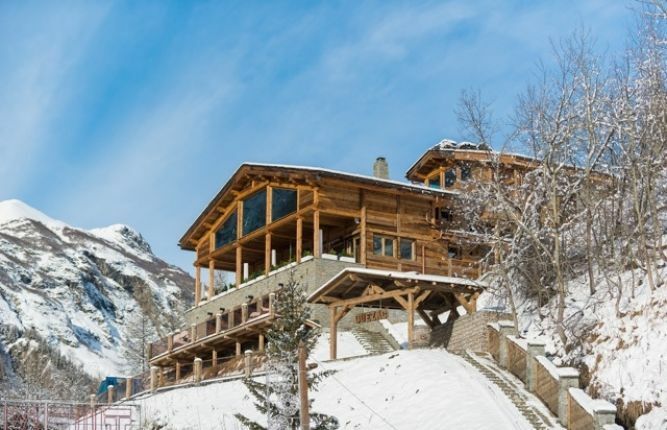 At present the price is set at €583,000 so better contact us before it increases! Ideally located just under 1 hour from Bordeaux and Bergerac airports this exceptional B&B (HH-6944499) with swimming pool and 2 barns is nestled on 11 acres of countryside. Nestled in the Sauternais, this stunning property (HH-10915282) is just 1 km from the village center and near all the famous chateaux in the area. It comprises 2 houses and 1.2 hectares of vines in AOC Sauternes. The inner courtyard leads to the master house with its double staircase, currently dedicated to oeno-tourism. Completely renovated with taste, a 20 m2 entrance hall leading to 33 m2 reception room welcomes all guests. There is also a beautiful colonial veranda of 45 m2, giving access to the 3 B&B rooms, each one with their own fireplaces and private bathrooms. There is a wine tasting room/reception of 100 m2 with a caterer’s kitchen, barrel shed and toilet. The second house comprises 150 m2 and has a country kitchen of 20 m2 adjoining the lounge/living room that is 55 m2. On the first floor there are 3 large bedrooms with bathroom. 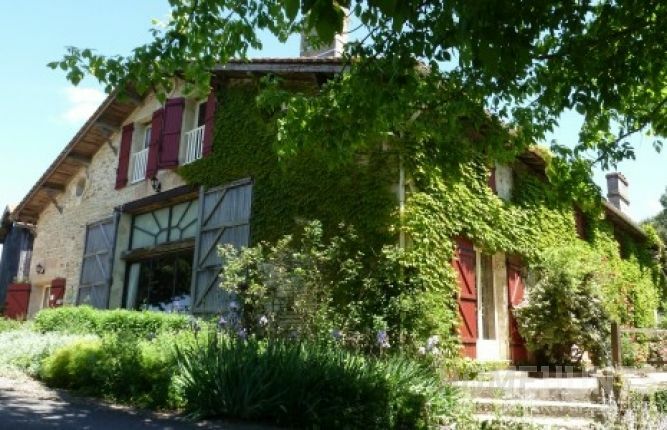 Another plus of this property is its wooded park with a swimming pool of 12 x 6 m. With vines bordering the property with a density of 6,500 plants per hectare and producing 4,000 bottles, this property is a steal for being a B&B and a wine business all-in-one for €705,000. 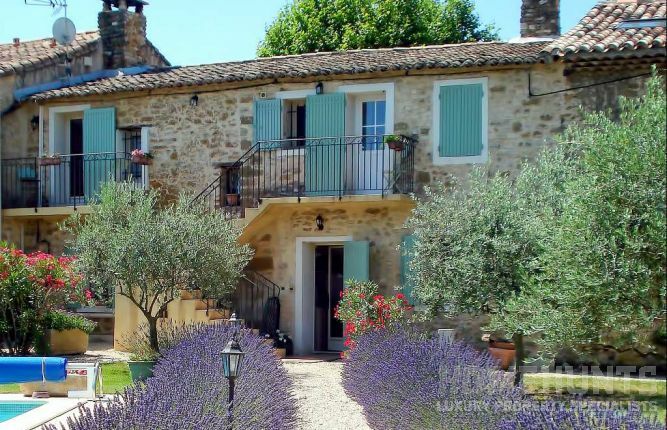 Located in Provence, Vaucluse, near the Dentelles de Montmirail and close to all amenities, this spacious 19th century farmhouse of 148 m2 (HH-8716981) is for sale, fully restored but retaining original beams and character features. Its flexible interior configuration and independent entrances would allow it to be used as a 4-5 bedroom main residence or holiday home or as 1 or 2 letting cottages. With 1,824 m2 of land comprising 2 parking areas, a large south-facing garden with mature trees, a pool area with 7 m x 3.5 m swimming pool, pool house/summer kitchen and outbuilding and a small olive grove to round off this very well-maintained property located 30 minutes from Avignon. Priced at €520,000.